The brown trout (Salmo trutta) is an originally European species of salmonid fish. It includes both purely freshwater populations, referred to Salmo trutta morpha fario and S. trutta morpha lacustris, and anadromous forms known as the sea trout, S. trutta morpha trutta. The latter migrates to the oceans for much of its life and returns to fresh water only to spawn. Iceland is known for both both the brown trout and the sea run brown trout. In some lakes in Iceland are population of brown trout that is believed to have been landlocked in Iceland at the end of the last Ice age, about 10.000 years ago, when the Ice melted away. Because of genetics the fish grows faster and hits puberty a little later than normal making it possible for the fish to reach a high age and enormous size. Normal size of a trout in Iceland range from 38-58 cm but it is common to catch a fish that is 60 cm or longer. The total population for brown trout have been growing in recent years, both in rivers and lakes. You can fish for trout in Iceland, all year long in some lakes but the main season stretches out from beginning of april until mid October. Prime time is June, july and August. If you are an angler that like to fish for brown trout with a fly, tactics change through out the season. We have many great trout rivers in Iceland, but most of them are located in north part of Iceland. All rivers in Iceland are private and we sell only limited nr of permits for each river, each day. 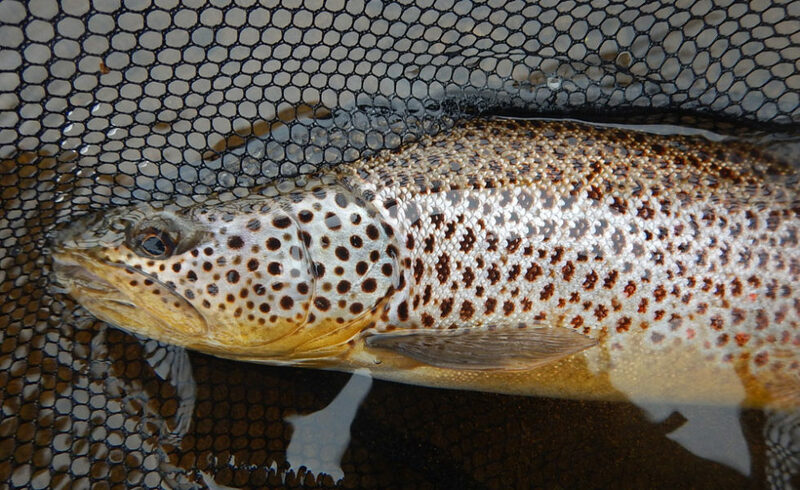 Please contact us if you want more info about fishing for brown trout in Iceland.